We’ve all seen it: 20-something skinny male model striding down a runway at Fashion Week, wearing something you wouldn’t wear for a bet. But is it all conceptual posturing or is it worth it for our gender to take just a little bit more notice of the runway fashion trends? Women’s magazines are full of the runway reports and pictures, but pick up a copy of Esquire or Details and you won’t see a runway in sight. So why is that? It turns out that the answer is very simple: women’s fashion translates directly from runway to rack. It’s edgier, more conceptual and what you see in Vogue may well end up looking quite similar in Top Shop. For us men it’s entirely different. Men’s clothing, even at its Parisien, fashionista, skinny model best is conservative by comparison. What you see walking down a runway will be massively tamed before it hits the stores. What’s needed is actually a slight mindset change among us consumers. Rather than laughing hysterically at Gucci’s latest striped all-in-one jumpsuit with attached blazer, we might notice that suspenders and double-breasted jackets could be a part of next season’s trend. 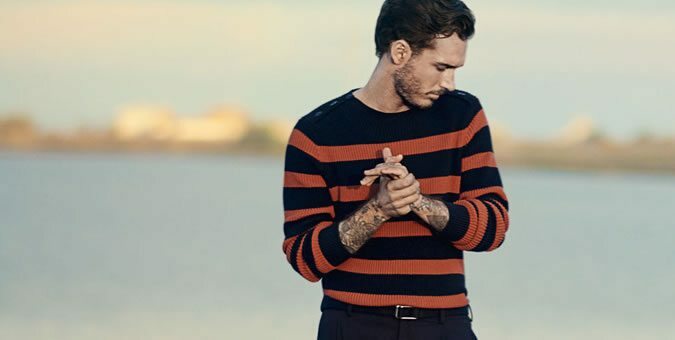 When three designers in a row feature stripes, it’s likely to translate into striped sweaters and shirts in the high street. There’s no doubt that the runways have a significant influence on the major brands and suppliers, whether you shop at JCPenney, J Crew or Barneys. You will see the trends in the stores and they ultimately translate to your wardrobe, so let’s not be too hasty to dismiss the runways just yet, even if they are the source of some amusement, too.